You will be given a reference e-book to read which has 502 pages And the test will be based on that e-book , you can take final test within 1 year of purchase. What is meant by Data Science for Business? Data Science for Business is the study of various processes and structures used to extract information or insights from data in several forms, whichever planned or unplanned, which is a continuation of some of the data analysis fields such as data mining, statistics, and predictive analytics, parallel to Knowledge Discovery in Databases KDD. Data science employs skills and concepts drawn from many fields within the broad areas of statistics, chemo metrics, mathematics, computer science, and information science, comprising of probability model, signal processing, statistical learning, data engineering, pattern recognition, data mining, computer programming, artificial intelligence, machine learning, database, and learning, picturing, foretelling analytics, improbability modeling, data warehousing, data solidity, and extraordinary performance computing. Procedures that measure to big data are of specific interest in data science, even though the discipline is not usually considered to be limited to such big data, and big data solutions are regularly focused on organizing and preprocessing the data as an alternative to analysis. The development of machine learning has enhanced the growth and importance of data science. Data science uses data research, information, predictive modeling and machine learning to scrutinize problems in several domains such as risk management, marketing analytics, agriculture, marketing optimization, fraud detection public policy, etc. It highlights the use of common procedures such as machine learning that apply without modifications to numerous domains. This approach varies from traditional statistics with its prominence on knowledge and solutions for particular domains. The logic is that evolving personalized solutions does not scale. 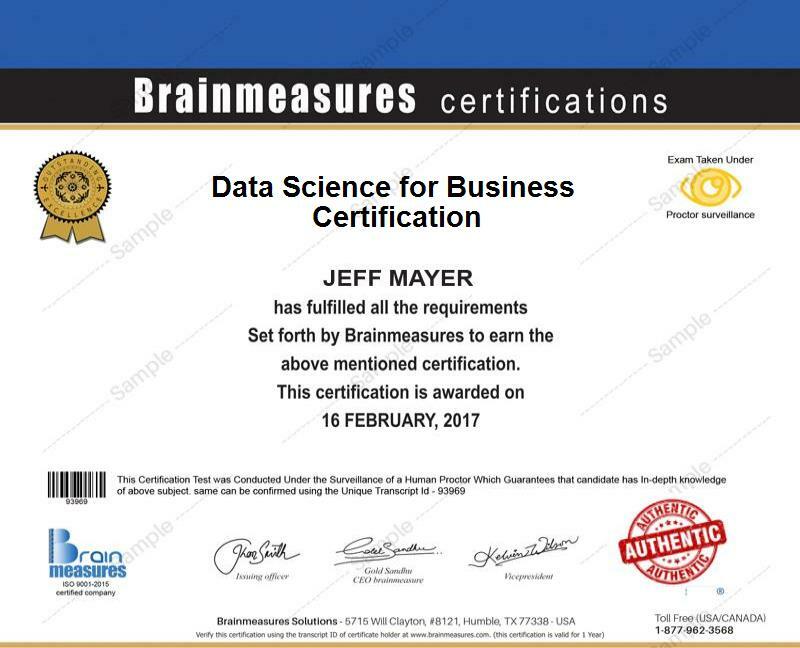 The Data Science for Business certification course by Brainmeasures covers all the significant elements of this subject in detail. Data scientists use their data and analytical ability to find and understand rich data sources, cope up with huge amounts of data in spite of software, hardware, and bandwidth limitations, combine data sources, confirm stability of datasets, construct visualizations to assist in understanding data, construct mathematical models using the data, and present and transfer the data comprehensions or discoveries. They are regularly anticipated to produce answers in days rather than months, work by fact-finding analysis and quick duplication, and to acquire or present results with dashboards demonstrations of existing values relatively than papers or reports, as statisticians usually do. The average salary of a Data Scientist is around $93,000 approximately. Salaries may vary depending upon personal experience and qualifications of an individual. Discusses about the importance of Data Science for business. Discusses about the Developers who will be implementing data science solutions. Explains about the creation and evaluation of data science solutions. Discusses the fundamental concepts of data science and how it fits in an organization and leads to competitive advantage. Discusses the general ways of thinking data analytically. Discusses about the general concepts for extracting knowledge from data. Explains about the unifying concepts, presenting specific tasks and algorithms. How data science and its fundamental concepts aids the reader and facilitates communication between business stakeholders and data scientists? The Data science for Business online certification course by Brainmeasures is a great opportunity for individuals who are keen on analyzing, handling huge amounts of data and becoming a professional business analyst or data scientist for an organization. With the advent of modern technology, business companies look forward to recruit individuals with the most updated knowledge, professional qualifications and expertise. This online course gives you the opportunity to study while working since you can get enrolled from any corner of the world and become a certified professional Data scientist. After becoming a certified professional in Data science for Business, the chances of you’re getting recruited in an established organization of your choice increase multifariously. This course would help you to enhance your knowledge in context to data science and will equip you with the most updated technology and understanding of the complete functionality and benefit of using data science formaximum growth and productivity of business in your organization. Certifications by Brainmeasures are recognized and accepted worldwide.